Amazing Grace and a Safe Haven: Spoiler Alert: Santa Claus is NOT Real, but Reindonkeys Are! Spoiler Alert: Santa Claus is NOT Real, but Reindonkeys Are! Before we ever brought Grace home, we had decided not to encourage the belief in Santa Claus. I read somewhere that things like Santa, the Easter Bunny, and the Tooth Fairy can be very confusing to adopted children--"If you would lie to me about these people, what details of my adoption story might you be lying about." We also didn't want to contribute to the commercialization of Christmas in our children's eyes. We didn't want this holiday to just be a mad gift grabbing event. We wanted it to be a celebration of our family. After all, Christmas Eve of 2007 is the day that Grace became our daughter. It is the day that our family was created. So it is not that we don't LOVE Christmas. We are just indifferent to Santa and presents. In fact, I am happy to say that none of the kids have asked for a single thing for Christmas. We don't have cable TV so they don't know that they are supposed to be begging for every new toy that gets advertised. So imagine my surprise this year when suddenly Grace became insistent about the fact that Santa is real. We've had this conversation, or variations of it, over and over this holiday season. "Grace, remember Santa is not real. He doesn't really live at that house." "Yes he is, Mama. Santa lives down there." "Grace, Santa is pretend. Just like a cartoon character. The man at that house is just somebody dressed up like Santa Claus, like for Halloween." "Mamaaaaa, can we pleeeeease go see Santa's house. I want a candy cane" (Grace is like a crack addict about candy). "Jesus was in his mommy's tummy?!? Like I was in a ladies tummy in China! How did Jesus get in his mommy's tummy?" So this is where I stop the conversation. I'm not quite ready to dive into virgin birth, the birds and the bees, or Grace's complicated adoption story. I just want to get rid of Santa. However, I do not want to get rid of reindonkeys. 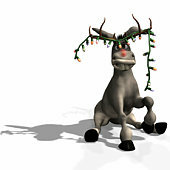 "Reindonkeys" is what Grace yells out each time she sees a reindeer lawn display. She got a reindeer stuffed animal as a gift at one point and was confused about the reindeer name for something that so clearly to her looked like a donkey. So she solved the name problem and invented the reindonkey. I love reindonkeys. It makes me laugh every time she says it. I don't know when I'll tell her the truth about how reindonkeys don't exist. Maybe I never will and it will just be our special family tradition. Good riddance Santa Claus, you have to leave, but your reindonkey's can stay.